Chest radiography of the patient showed minimal hilar shadows with no other lung changes, but the heart shadow was increased and pericarditis was suspected. 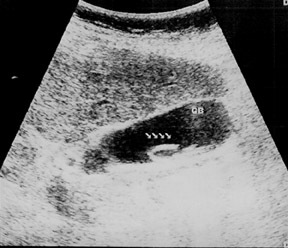 Ultrasonography showed a tubular, nonshadowing structure with highly echogenous walls and a less echogenous center in the lumen of the gallbladder. The mobile, tubular structure was approximately 15 cm long, with a diameter of approximately 0.5 mm (Figure 1). When found in the gallbladder, an Ascaris lumbricoides infection most often requires a cholecystectomy.8 Once the patient reported here began antihelmintic therapy with mebendazol and metronidazol, there was spontaneous elimination of the ascaris from the gallbladder and the intestines. But the infection was not cleared from the small intestine. One month later, the anemia, hypoproteinemia, eosinophilia, and pericarditis were reduced significantly. The infection of the gallbladder with Ascaris lumbricoides is not frequent, but ultrasonography screening can be the key diagnostic tool in the diagnosis and evaluation of response to treatment. Laing FC. The gallbladder and bile ducts. In: Rumac CM, Wilson S, Chabonau JW, Johnson J, eds. Diagnostic Ultrasound. 2nd ed. St. Louis, Mo: Mosby-Year Book, 1998. Liu LX, Weller PF. Intestinal nematodes. In: Fauci AS, Braunwald E, Isselbacher KJ, et al, eds. Harrison’s Principles of Internal Medicine. 14th ed. New York, NY: McGraw-Hill; 1998:1208-1209. Khuroo MS, Zargar SA, Yattoo GN, et al. 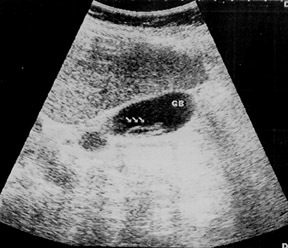 Sonographic findings in gallbladder ascariasis. J Clin Ultrasound. 1992;20:587-591. Ozmen MN, Oguzkurt L, Ahmet B, et al. Ultrasonographic diagnosis of intestinal ascariasis. Pediatr Radiol. 1995;25(suppl 1):S171–S172. Coskun A, Ozcan N, Durak AC, et al. Intestinal ascariasis as a cause of bowel obstruction in two patients: Sonographic diagnosis. J Clin Ultrasound. 1996;24:326-328. Bude RO, Bowerman RA. Biliary ascariasis. Radiology. 2000;214:844-847. Misra SP, Dwivedi M, Misra V, et al. Preoperative sonographic diagnosis of acute appendicitis caused by Ascaris lumbricoides. J Clin Ultrasound. 1999;27:96-97. Javid G, Wani N, Gulzar GM, et al. Gallbladder ascaris: Presentation and management. Br J Surg. 1999;86:1526-1527. Ascaris lumbricoldes in the gallblader. Appl Radiol.